This is a rudimentary question--perhaps the answer is well known to biologists, but is every neurotransmitter receptor also an ion channel? 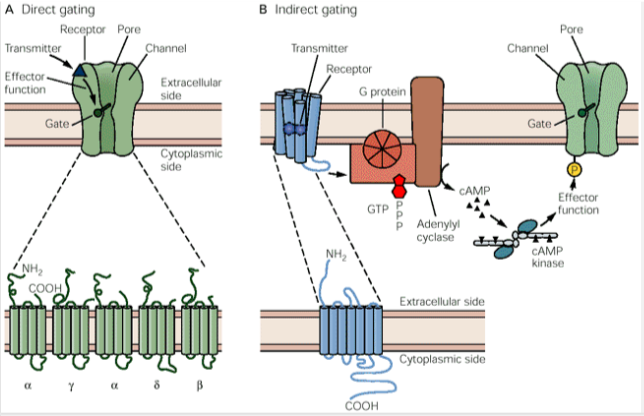 For example, NMDAR is a glutamate receptor and cation channel and GABA_A receptors are gated ion channels. Is this true generally? If not, is there a classification of neurotransmitter receptors according to abstract function (e.g. all gated ion channels would form one class, then perhaps there are others)? Thank you in advance! I am a mathematician just getting interested in some biology problems and trying to organize the basic knowledge in this area. I appreciate any insights here! is every neurotransmitter receptor also an ion channel? Not the answer you're looking for? Browse other questions tagged cell-biology neuroscience physiology neurotransmitter cell-signaling or ask your own question. Does one neurotransmitter travel all the way through the nervous system?